Manila, Philippines – More than 80 students from 14 universities nationwide gathered in UP Diliman on March 7-9 to discuss and propose solutions to education concerns in the first UP National Congress of College Councils. There are more than 2,000 higher educational institutions in the country, each facing issues unique to their area. The student participants discussed ways to push for reforms in the education sector and also tackled other national issues that affect the youth. Arnold Ferolino, a student from Western Mindanao State University in Zamboanga City, is unsure of his position on the pork barrel scam. As a congressional scholar, he is one of many who were directly affected when the government decided to freeze all scholarships funded through Congress' priority development assistance fund (PDAF). At the Western Philippine University, students are opposing the building of a coal-fired power plant in Palawan. According to environmentalists, the province may risk losing its UNESCO heritage status should the proposed project push through. In UP Diliman, both students and the administration are divided on the advantages and disadvantagesof the proposed academic calendar shift. The university's socialized tuition scheme also remains an important debate, despite a recent reform of the program. UP Diliman student council vice chairperson Jules Guiang said the NCCC was born out of a desire for campus college councils to go beyond their campus pushing for educational reforms. 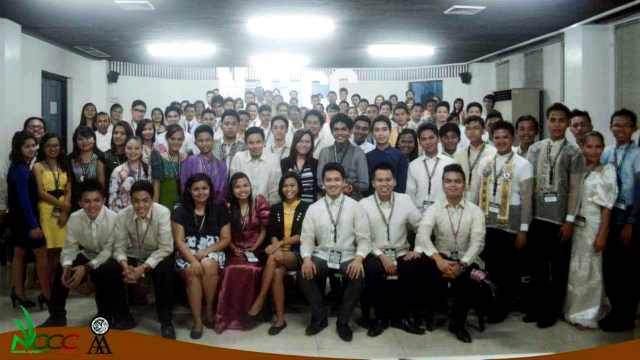 Guiang, along with the leaders of college councils in UP Diliman, convened the NCCC. “It is about time for UP to the take the lead among SUCs (state universities and colleges) and other universities in forwarding educational reforms. The NCCC is the most concrete way to make that possible,” Guiang said in Filipino. Invited speakers Kabataan Rep. Terry Ridon and former national treasurer Leonor Briones of Social Watch spoke in depth on the state of education and public spending on education. According to Ridon, the government has been initiating policies, such as unregulated tuition fee increases, that are hindering the potential of the youth and neglecting the welfare of the students. Briones said that while statistics show that the poorest provinces are found in Mindanao and in the Visayas, they receive the lowest appropriation from the national budget. Briones cited one SUC in Mindanao that gets the lowest appropriation at P24 million. “If the budget should be about poverty reduction, the budget should go to where the poor are,” Briones added. This is the reason why, according to Ridon and Briones, student leaders should “utilize social media, technology and other new venues of collective action” to engage the government and push for reforms. To Ferolino, the discussions gave him a better understanding of the education sistuation in the country. UP student regent Krista Melgarejo, National Union of Students in the Philippines (NUSP) member Sarah Elago, and Student Council Alliance of the Philippines (SCAP) member Ruevin Serrano discussed the state of student movement in the country. Melgarejo and Serrano agreed that one of the challenges facing student movements today is harnessing active student participation especially on issues relating to their right to education and social services. To emphasize this, Elago enumerated the movements spearheaded by the NUSP that eventually led to action on the part of related government agencies. The conference participants did not stop at talking. The students formed 8 discussion groups to produce output papers and proposals tackling issues such as corruption, the K+12 program, privatization, PDAF, and the foreign influence in government policies. On the issue of government spending, the group raised the following problems: education spending isnot in sync with international standards which leads to deficit in the quality of education, lack of transparency and accountability, and the need to localize government support. The group proposed that the government should raise state subsidy for education, provide job opportunities, improve school facilities, and pass the FOI bill. The group also proposed that public spending for education should be raised to 6% of GDP. At the end of the conference, these papers were presented to government agencies and institutions like the Department of Budget and Management (DBM) and the Commision on Higher Education (CHED). DBM Director for Social Sectors Christina Clarasa received the 8 proposal papers. While giving no assurance that the proposals will be acted upon, Clarasa expressed her support for the potential of NCCC to strengthen participatory governance among the youth.